I've been so drawn to white and cream lately. I've actually thought about painting my yellow walls downstairs white. I'm still undecided though. I'm not into all white rooms but I like a lot of white, which you've probably already noticed it you read my blog. 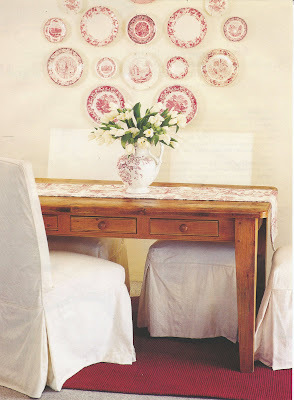 I like how white or cream backgrounds really make the color pieces POP...like the transferware above and the pink glasses on the table below. I love how these botanical prints really stand out. These don't even need fancy frames, look how simple these frames are! I love that. I really love the summery feel of white. Isn't this bedroom beautiful! I think bedrooms are my favorite rooms to decorate. Do you have a favorite room to decorate? Great pictures! Funny I was just looking at the one with the botanicals last night when I was looking for pictures for today LOL! I always like other people's white walls, esp if there's white slipcovered furniture, but I don't think I could do it. White and cream are such soothing colors and they do allow other elements to shine. Your photos are such perfect examples of the serenity of creamy white walls and fabrics. You are so right that they allow accessories and companion pieces to shine, and it is a style that you work so well with yourself. This look really is one that I think "Cindy" when I see it...I can tell in your own beautiful decorating that you love it. When you love it, it loves you back...and that shows! This is my very favorite color combination. If you like it, you might like the book by Victoria "Decorating with White". I refer to it so very often that it remains either by my bathtub or on my nightstand. Thanks for choosing such a pretty romantic palette for Your posting today! I really like those pictures. I think white is pretty, even though I have a lot of color right now. We are always changing, that's the fun of decorating. Oh, those rooms are so lovely! My home is quite different, all dark wood and wallpaper (countrygrl125 from HGTV's Rate my Space)but if I ever had the luxury of starting fresh, I would love to do creams and whites. Thanks for the inspiration! I'm soothed again...here at this post. I have always and forever coveted a bedroom I saw one time in Victoria that was shades of white and cream ranging from white white to a dark ecru taupe. It was simply to die for. I won't get that because it would require a new almost everything, and I have my computer in my bedroom, which would ruin it, too... but I love those rooms. In my own home, I have dark walls... I'm a cubby hole girl with a longing for dark walls, floors..... and then brighter and whiter in other stuff... Oh, and favorite room to decorate? I think kitchen. I love your blog! Just wanted to say I also LOVE cream and white! I love the idea of of a bedroom done in all shades and textures of white. That would be especially nice during the summer. I love those photos! They look so serene. I love to see them in photos, but I wouldn't feel comfortable living in an all-white room. Ouuu Cindy that breakfast nook is soooo wonderful! 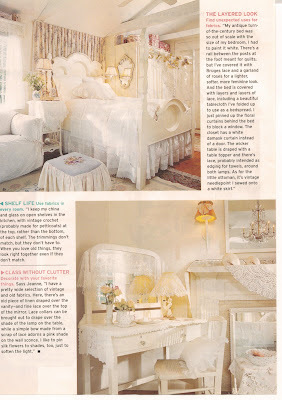 I love the softness and sothingness of whites n creams with just a pinch of color here and there! Gorgeous photos -- and I'm always impressed with the wide range of shades of white, ivory and cream! And the wonderful use of textures in the all-white rooms too! Thanks for sharing! I'll be really interested to see what you decide on painting. I struggle with this! 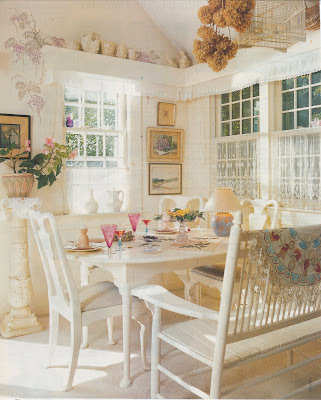 I love all the photos of white/cream combos (that dining nook I think I've seen before--stunning!). And I love them, but whenever I try to paint white in my own house it seems so sterile, not serene and lovely like the photos, and I can't figure why. Any ideas? You mentioned your compulsion to post daily. I check your blog daily, and I would be very disappointed were there no post for a given day. I wish that you posted on weekends! I very much enjoy your posts about your own home. 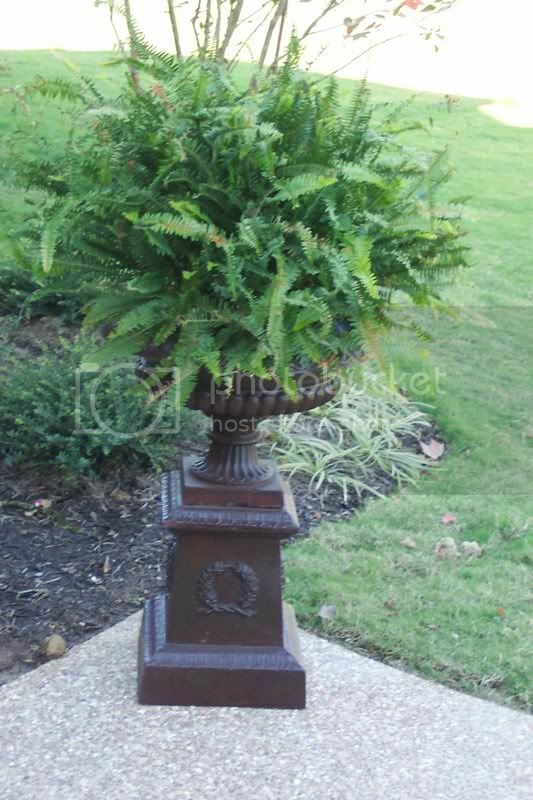 The inspiration Friday posts are lovely, but I much prefer the posts about the treasures that you find, and how you change yard sale finds into heirlooms. Your blog is cozy, charming, and inspirational. Oh so lovely. I am also a fan of white for decorating. My favorite room to decorate is the powder room. I love coming over here especially when it becomes too hot to bear here. Thanks for dropping by. I've been meaning to add your site (I love it) as a link but I've been swamped with book work. Gibbs is interetsed in a sequel on Romantic Cotages. If you's like the art director to take a peek at your home, you'll need to e-mail me photos as attachments. The art directors won't accept any scouting shots that aren't individual digital photos. Just came across your blog and flickr site. 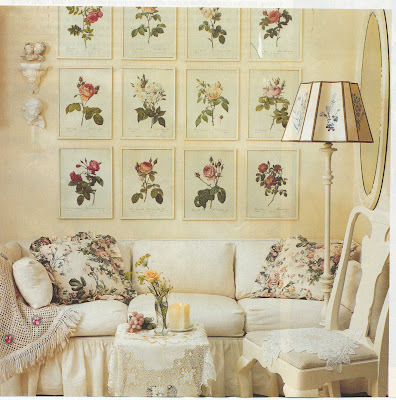 I love your photos, I am also very fond of decorating with white and cream. Your rooms all look very pretty. I love love love white. Thanks for these gorgeous pictures. I am toying with painting some walls white myself. I never have, but always love photos like that. You've given me more reasons to contemplate doing it now. Pretty nice blog you've got here. Thank you for it. I like such topics and everything that is connected to this matter. I definitely want to read more soon.